Talk about a book that has inspired me to make a second Recent Friendship Favorites post. Immoral Code is a book about revenge, family, and friendship. I adored it the more I kept reading it. Immoral Code is one of those books that charms you. Not because it is always shiny, but because there’s something so endearing in its pages. In these characters, their secrets, and the ways these friends dance around each other. You fall in love with each of them in turn. And then when they enter together, the whole world bursts into color. 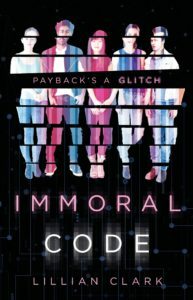 If you love books with friendship, with teens who hold their friends accountable, and the last moments of high school, then you have to check out Immoral Code. Not to mention that Reese is both asexual and aromantic, which was just so validating to see on the page. In general, Reese is just a character that defies conventions with colorful hair, a sense of style, and being too loud for those around her. Except her best friends. In a sentence, Reese doesn’t believe in regrets. And I love her for it. While Reese is seen as the ‘wildest’ character, it’s not without fear or acknowledgement. What I loved about all of Clark’s characters is that not only do they come alive because of the multiple perspective nature of the novel, they have such vivid personalities. Their words, their likes and dislikes, the ways they fit in between each other, springs off the page. Each of them has their own dreams and fears all wrapped up in a story. In many ways, Immoral Code is a story about four teens, and their friendship, not just the ways they interact when in a group. Santiago, my sweet precious diver. I couldn’t be more different from you, mostly because I barely can swim at all. But I appreciate your desire to be bold, to chase your dreams, to break free from the idea that pursuing a life of careful considerations of success is better than the risk of following a big dream. Santiago’s life is largely shaped by his parents mentality of sacrifice to immigrate to the US from Mexico to give Santiago a life full of chances. All the way to Keagan, the sweet sensitive friend, who, while he knows he has privileges, just doesn’t get it sometimes. Not only that, but this idea of not having ‘that dream’ that his friends have. To be a doctor, to own their company, to dive. To just want to survive and be happy. I feel like I was somewhat like this, but without realizing it. I had goals, but they were just to get to the next hurdle, not to see the finish line. To Bellamy and her logical mind, that would simultaneously scare me, while I admire the heck out of her. And her life of poverty, going without, and witnessing the effects of money on their rent, their lives, and her mother. My heart ached for Bellamy, for her desires, and for the feelings of abandonment she feels towards her father. I think Bellamy’s deep feelings of hurt, reflect most my confusion and pain over my birth mother. And so I could really relate to her emotions. But also the deep unfairness of her situation, being denied a chance to go to MIT because of a father she doesn’t know. Last year was one of rage, disappointment, and sadness about how unfair pieces, heck the whole society can be. And Nari, my precious favorite biracial character and hacker extraordinaire. The way she is fiercely loyal to her friends, and absolutely willing to fight, to lie, and steal for Bellamy. All the subtle ways she speaks to my heart, from her indignation about the government, her feminism, all the way to her detail oriented personality. And then from this brilliant foundation of friendship and personality, you have a plot that is absolutely magnificent from Clark. It is one that has almost spy level reconnaissance, tons of hacking, and loads of science. It’s easy to read for the friendship, for the brilliant heist story line, but what pulls it together is the way their friendships change. The hard conversations, silent shows of solidarity, and challenging interactions. And the book only gets better as you continue to read. I don’t want to spoil anyone, but it becomes deeper, taking on new shades, and added complexity. Find Immoral Code on Goodreads, Amazon, Indiebound & The Book Depository. What is your favorite book with hacking in it? I think this is the first I’m hearing of this one, and it sounds pretty good! I’m adding it not only to my TBR, but going to order it for the school library where I work, so my students can read it! Great review! You can check out one of my latest YA reviews HERE. Thanks for the link! And it’s a great idea for the students! Thanks!! I love this book so much!